One of the great things about doing your own van conversion is that you can make it exactly as you want it. This page provides some help on where to find good example layouts and some tools to help you pick the best layout for your needs and tastes. 7 Comments, Questions, Suggestions, Ideas? How many people will you need seating for? How many people will you need bunks for? Do you need full standing room? How much storage space do you need for all your junk? Do you want to be able to cook? Inside? Outside? Are there large “toys” (bikes, ski boards, motor cycles,…) that you want to haul? Do you want a light and open feel, or a more private space, or a “stealth” van? I think its a good idea to make a list of all the things you want to include in the van and check each potential layout against the list. Lots of van conversions have been done over the years, so there are lots of good sources for layout ideas out there to help you get started. There are some good YouTube videos that show a variety of layouts for camper vans. This one from Which Motorhome Magazine does a video tour of 15 different commercial European camper vans. Which Motorhome is based in Europe and has years of experience with RV’s and RV layouts based on Ducato, Sprinter, and Transit size vans (as well as smaller and larger vans) — so, a good place to get ideas. 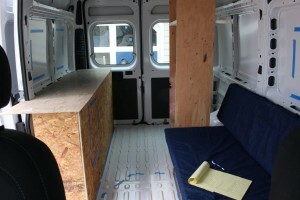 The forums for the various vans all have posts that show a variety of layouts and a lot of discussion about them. RAM ProMaster, Ford Transit, and Mercedes Sprinter are three of the forums. Look for the section of the forum that covers camper or RV “builds”. Sportsmobile has some good example layouts with pros and cons and some tools to make layouts (see below). 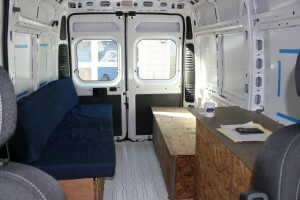 The ProMaster Forum has a thread that is a collection of interior layouts that have been used on ProMaster conversions mostly by forum members. This is an article from Paul N. that shows a unique layout that uses the back door as the main entry door instead of using the sliding door. Worth considering for several reasons. The nice thing about doing your own van conversion is that you can get the exact layout and equipment you want. There are several tools you may find helpful in refining your layout. These tools help you determine if your ideas for layout actually fit the space and to adjust if they don’t. Paper Diagrams: I like to do paper sketches like this one just below. This is simple, easy, and does not take much time. Just get some quad ruled paper, pick a scale so you can draw accurately (about 1 inch per foot) and have at it. Its easy to try a lot of ideas as it takes so little time do one of these sketches. Be sure to draw things to scale as it will point out things that sound good, but don’t actually fit in your space. Another example of paper layout sketches… (a bit nicer than mine). SketchUp: Another good tool is SketchUP. This is 3D CAD drawing software that is pretty easy to learn and use, and the regular version (which is very capable) is free. It might take about a day of playing with it to get to the point where you can use it well enough to do a van layout. 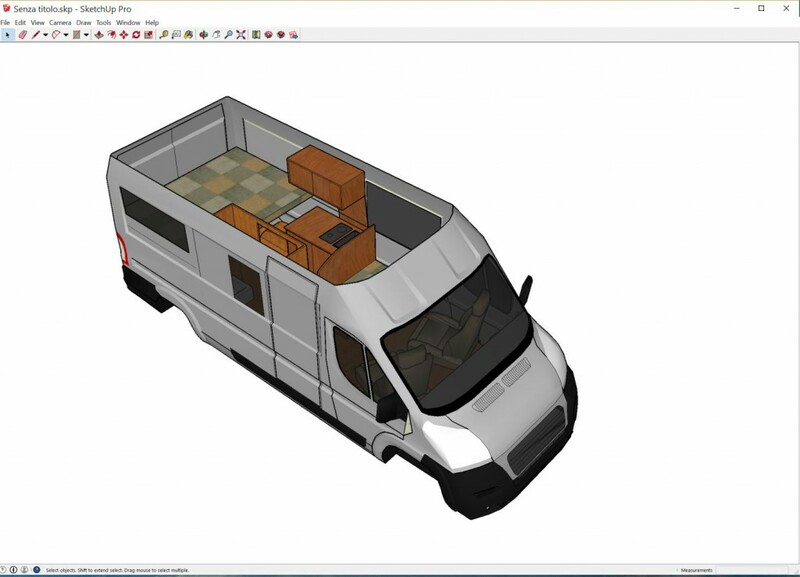 SketchUp model of camper van. I have to admit that while I’m fairly good with SeketchUp, I never used it on this project. It seemed like some paper sketches going to crude real mockups worked out better for me — but, everyone is different. DYO Studio: Sportsmobile has a couple of nice tools that allow you to start with an empty van and fill it with cabinets, beds, galley, … and then rearrange until you get what you want. They support a number of vans, and have a big library of van furniture you can add. There is one version of the tool that works with scissors, paper and glue, and a 2nd version that does all the same stuff using an online tool. Sportsmobile also shows a number of layouts that they have built — a good source of ideas. Mockups: You will probably end up with a few layouts that you like and need to decide which is the right way to go. I am a strong believer in real 3D mockups when you get to this stage. There is nothing like setting up a rough mockup inside the van and actually being able to sit in it, laydown on the mockup beds, check the galley space for actual cooking, and assess whether it just feels right to you. I can almost guaranty that your feelings about some of the features of your layout will change if you take the time to do a rough mockup. Compared to the hundreds of hours that may go into the actual conversion, a couple extra hours to do a rough mockup is nothing. As the pictures show, the mockups can be very crude and made from scrap wood and cardboard. They just need to be full sized and allow you to live in the actual layout. I think its a good idea to leave the mockup in place for a few days so you have a chance to think about it and allow time for questions to come up. Is the weight and balance for your layout OK? That is, try to avoid concentrating the heavy items in one area or on one side. Does your layout allow for placing all the key items you will want, like water tanks, propane tanks, electrical equipment… Check for things like: Is there a path under the van that will allow you put in the drain line from the galley sink to the grey water tank? If you are going to have a conventional toilet with a black water tank, is there a space for the tank under the van where the toilet is? 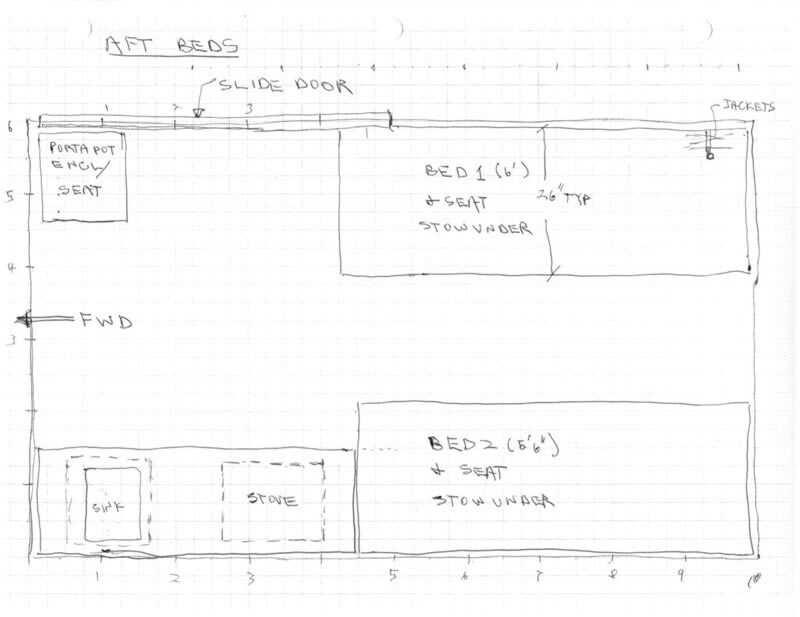 Its easy to get so wrapped up in the sketches, diagrams, and in getting all the stuff in that you can lose track of how the van will feel when you get it built. For us, this means a nice open space with good views out. It may mean something totally different to you, but spend some time thinking about whether that layout you slaved over that gets everything in is also something you will like spending time in. Is there a good place to sit and read, or look out the window with a cup of coffee…? Our last RV was a Coachman Class B based on a Dodge van. It was a nicely constructed RV, but in an effort to get every kind of RV gadget known to man in it, they ended up using up much of the space inside for “stuff”, and it ended up having a very tight and confining feel inside not to mention a fold out bed that was torture to sleep in. We ended up ripping out much of the interior and replacing it with a simpler, less cluttered layout that emphasized a good bed, a minimal cooking area, and a nice open feel. I guess the message here is that in addition to getting to a layout where everything you want fits in, spend some time thinking about how its going to be to live in — how it will “feel”. The real 3D mockups discussed above are very good for this stage. I noticed you didn’t spray foam insulate the floor of the conversion on the older site. I’m insulating mine next week. Is there a reason I shouldn’t foam the floor? If you used it on the floor, I think you would have to cut or saw it off to the desired thickness. I decided this was too much work and used the rigid foam polyiso sheet instead. I think you could make the spray foam work if you want to go that way. I think I mentioned in a couple places that if I were to do the insulation over again, I would probably use the rigid polyiso that is glued in place with Great Stuff foam in a can for walls, ceilings and floor – see the insulation pages for details. Its not that there is anything wrong with the spray foam, but it is more expensive and more nerve wracking to install than the sheets of polyiso. But, if you like the spray foam, it works just fine. Hello! I just purchased a Dodge Promaster and I’m excited to start adapting it to my needs. I am an art handler and needed a van to transport artwork, but I also want an adventuring vehicle. Have you heard of anyone doing a modular design in which the bed and galley can be removed? I have some rough ideas, but I’d love to chat with anyone who has tried something similar. There are definitely people who have done their conversions in such as way as to make it quick and easy to remove the furniture and open up a big cargo hauling space. You might take a look at the part of the ProMaster Forum that has descriptions of conversion builds. I recall that the conversion done by RDinNHandAZ has build description that has easy to remove furniture, but there are others as well. Check out Glampervan in San Francisco. They have a murphy bed approach that opens up the center space for cargo & other materials. Very nice set up on the ProMaster. Choosing our floor plan was so exciting: that is when the real job is starting. After one month living in our van we are really happy about it. We went for something different from most of the other vans we can see online. There are bulkheads available, and I think you can add them to a van that did not come with a bulkhead. I guess you could build one, but I think you would want to have a look at how the commercial ones are built and how they tie into the van structure. On ours, I put some effort into anchoring the bed platforms, galley cabinet, and other cupboards well enough to stay in place during a significant crash. The idea was to anchor things well enough to not need a bulkhead for crash protection. The advantage of this is that you get to use the cab space as part of the available space in the van when camping — you don’t lose the cab space. You can see the method used to anchor the furniture in place if you look at the sections on the galley and the beds — mostly bolting down to the floor. I’m not enough of a structural engineer to say for certain that the techniques I used to anchor the furniture will actually keep them in place during a serious crash, so you will have to do your own homework in this area. Maybe you’ve mentioned this in other posts I haven’t read yet, but some vans have built-in bulkheads (for safety reasons in a crash) and others don’t. I like the bulkheads, but I also want a passageway between the driver’s seat and sleeping area in case I need to move the van without going outside. There’s the safety issue of heavy cabinets, etc, and a sudden stop too. Just a thought that should be included in a discussion at the beginning of the design? And could you build your own or are they by necessity something that needs to be bought in place at the outset? Do some brands include them and others not?